Hundreds of Syrians poured into the streets of Damascus on Saturday, dancing and chanting in defiance of what they called the West's "failure" to shake their nation's resolve with airstrikes that jolted the capital only hours earlier. The demonstrations in support of President Bashar Assad were carried live on state TV, which also reported that Syrian air defenses had intercepted most of the missiles fired by the United States, Britain and France to punish Syria's purported use of chemical weapons. The broadcaster also urged people not to believe media reports that exaggerated the results of the airstrikes. "We are not scared of America's missiles. We humiliated their missiles," said Mahmoud Ibrahim, who waved a Syrian flag as he hung out of his car window. As car horns blared, the crowd moved toward nearby Damascus University where pro-government fighters danced and waved their automatic rifles over their heads. Many denounced U.S. President Donald Trump and also waved flags of Syria's allies, Iran and Russia, as they cheered Assad. The display of national fervor later mixed with celebrations over the news that the Syrian army declared the eastern suburbs of Damascus "fully liberated" after the last group of rebels left the town of Douma. Its recapture marks the biggest victory for Assad's forces since the capture of the eastern half of the city of Aleppo in 2016. The fall of Douma came after a punishing government offensive and a surrender deal struck with rebel groups. It also followed the purported use of chemical weapons there on April 7, which activists say killed over 40 people in the town and led to Saturday's airstrikes by the West. "Trump failed in his aggression," said 51-year-old civil servant Mohammed Hammad. "Trump's failure came with the victory of our army in Douma, which marks the biggest victory for the Syrian Arab Army." "Good souls will not be humiliated," Syria's presidential account tweeted after the airstrikes began. Later, a video showing Assad walking into his office carrying a briefcase was posted on the same account. "Good morning, steadfastness," the caption read. As the sun rose, hundreds had gathered in Damascus' landmark Omayyad Square, celebrating what they said was the army's success in foiling the U.S-led military action. The widely broadcast celebrations and the hastily organized police deployment in Douma appeared to be the government's response to the airstrikes. Trump announced the airstrikes Friday night to attack Syria's chemical weapons program. He said Washington is prepared to keep pressure on Assad until he ends a "criminal pattern of killing his own people" with the internationally banned weapons. On Saturday, Trump tweeted "Mission Accomplished," and the Pentagon said the strikes hit the "heart" of Syria's chemical program. The U.S. had fired Tomahawk cruise missiles at a Syrian airfield in April 2017 in retaliation for Assad's use of sarin gas against civilians. Nasr al-Hariri, a senior opposition leader, said the international community must take responsibility for any retaliation by the Syrian government against civilians in opposition areas. He called for a strategy that leads to a political solution to "save it from the brutality of the Syrian regime." Mohammad Alloush, spokesman for the Army of Islam rebel group that was expelled from Douma, tweeted that the airstrikes were a "farce." 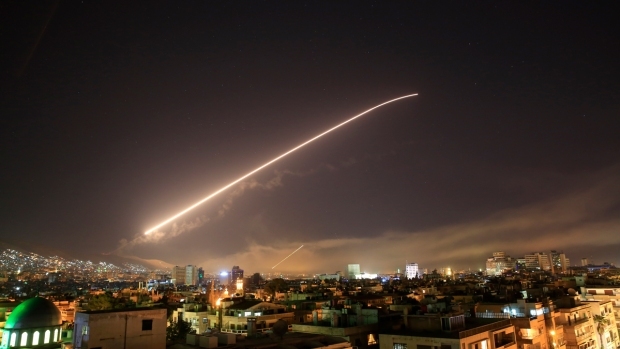 A Syrian military statement said 110 missiles were fired Saturday by the U.S., Britain and France and that it shot down most of them. Russia's military said Syrian air defense units downed 71 of the missiles. Marine Lt. Gen. Kenneth F. McKenzie, director of the Joint Staff at the Pentagon, said no missiles were stopped. 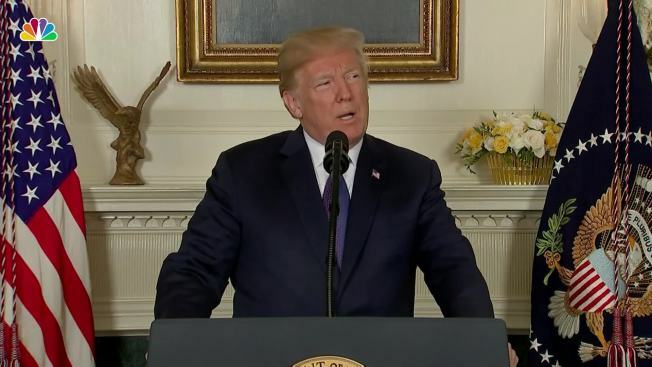 He added that Syria's air defenses were ineffective and that many of the more than 40 surface-to-air missiles fired by the Syrians were launched after the allied attack was over. He said the U.S. knew of no civilians killed by allied missiles. A "number of missiles" targeted a scientific research center in Barzeh, near Damascus, and destroyed a building housing an education center and labs and caused other damage, the military said. Russia and Iran called the use of force a "military crime" and "act of aggression." The U.N. Security Council met to debate the strikes, but rejected a Russian resolution calling for condemnation of the "aggression" by the three Western allies.